Lala.com is a music sharing site that's been around for maybe a year or so. They've built some great traffic and have a product I use every day now. I first heard about it actually from Posterous users who kept asking for the ability to embed Lala.com in their blog posts. It's US-only for now (sorry, International friends) but at least now I don't have to pine away for a re-activation of my Spotify account. As a product, it's great. But there is always room for improvement. Here are a few basic design changes that I think could give a big ROI. When I first saw lala.com, I thought it was yet another in a line of many music services. I, like every new visitor to every site, had my mouse hovering over the back button. Luckily I stayed around long enough to discover its value. They have pretty great song libraries that have everything from hits to the obscure parts of the catalog. And they allow you to play the whole song through once for free, which is very impressive. They've expertly engineered the site to be playable at all times even during browsing. This means you can actually just browse around the site without ever stopping your music player. (It's something that our friends at YC-backed thesixtyone.com do really well too.) 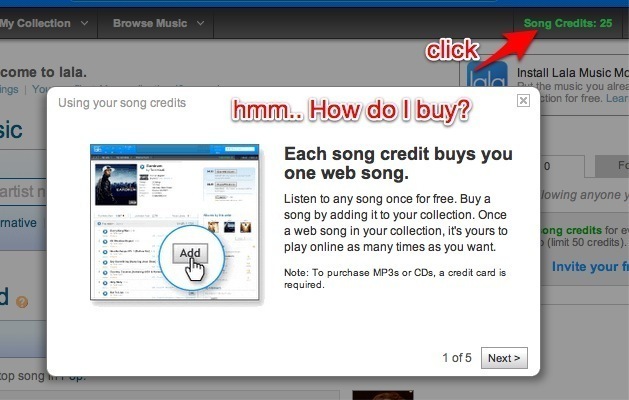 But the main call to action on most songs and albums isn't to take advantage of this ability to create playlists. Instead, it's a play button that causes it to play now. Many users may not even realize they can queue long playlists of songs. Instead, a 'queue' button is next to it, but as all designers realize with time -- if it's a secondary action, nobody uses it. The fix: Make the queue button default, and show a tooltip or flyout that teaches the user that they've added something to their playlist. Heck, make an ongoing sidebar to the right to reinforce the playlist concept. A single song play may only last 3 minutes, but if you can get people to create playlists of music, then you've a) achieved incredible lock-in and b) proven that you're valuable. You've beaten the back button, at that point. When you're new, focus on being as simple as possible. But when you're in a crowded space, you have to focus on showing the user how you are different and better. Lala is interesting because of a voluminous on-demand catalog of music that can be your new music player playlist. So focus on that. 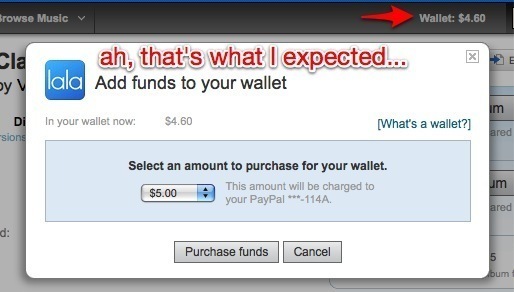 2) Once you prove to them you're valuable, make it easy for the user pay you and buy into the system. Lala has a concept of song credits, and when you sign up, you get a prominent item in the menubar that lists how many song credits you have. You can listen to any song in their system for free once, but if you want to play the full length song again, it costs 10 cents to 'buy the web song' and stream the full length song forever. Like Spotify, without the monthly fee. It's OK and even desirable to have great explanatory text around how your site works-- but don't hide functionality that is the critical path to the user who wants to buy into your system. Building user experiences is just a repeating conversation you have with thousands of users every day. A faux pas here or there will not necessarily doom you, but it costs you some percentage of future customers in the end. For a service that hopes to be viral and organic, a few percentage points in conversion can result in significant deviations in outcome and success. A first impression is make or break, whether in person or on the web. Make yours count.